Far fewer Christmas cards arrive in the mail nowadays. I think it's a combination of lack of time, rising postage costs, and the ease of digital communication. However digital we may be, there's still a frisson of delight when a hand-addressed envelope is plucked from the mailbox. Amy of Love Made My Home has organized a Christmas card exchange for a couple of years. It's a fun way to connect with another blogger, and to receive a real card in the mail. I was partnered with Kathy of Compassion Knit and received this cute and playful card. For now the cards stand on the hall table, in front of the Advent Calendar, which, as you can see, is rapidly filling up. The paperwhites are just beginning to open and their lovely sweet scent wafts upwards as I climb the stairs. These days fill up, as December tends to do. Last week we attended Miss S' preschool concert. She's looking a little tired and wired here, and the gym lighting cast rather harsh shadows on her face and that of her Grandpa's as they sat on the floor enjoying their snacks. Later in the week we celebrated Miss A's birthday. It was pajama day at both her school and her cousin's preschool, hence the flannel party attire. Pretty rainbow cupcakes not only looked good, but tasted yummy, too. Little brother enjoyed riding on Grandpa's shoulders, just like his father used to do. We had guests for breakfast on Saturday - Miss S and her parents. I've wanted to try these French Toast Cubes for awhile, and this was the day. They made a fine accompaniment to eggs baked in ham cups and English muffins, and fruit. The sweetness can be controlled by the amount of cinnamon sugar, and although the recipe, here, suggested dipping them in maple syrup, I decided that would be sugar overload. There's certainly enough sugar around these days! Thank you for your kind comments on my little story in the previous post. Miss A was over yesterday and got right to playing with the scene. Ironically, as most bloggers stop posting as we draw nearer to Christmas, I'll likely put up a few more posts than usual. It was lovely to wake up this morning, knowing I would be home for the day. Little people do get tired t the end of a busy term at school, and there are so many extra things happening, such as plays, parties etc. Sadly we have had to cut back on cards this year, I think many people have, as postage has gone up again in UK. Many of the ones we have received have Robins on. You are right about the Christmas cards. We get a lot of the annual letters emailed now. While I miss pulling them from the mailbox, I'm so glad to still hear from friends. I also enjoy the photos that come, and the creative photo cards especially from our young friends. I can understand your love of a day at home. What a relief to come home and know I don't have to go out again! Especially this time of year I enjoy being home with the lit tree and decorations to enjoy. It was so lovely to hear about your Grandchildren's little adventures, they are such a joy. Sadly the rising cost of postage in the UK has stopped many people from sending cards, which is such a shame. I love how you have displayed your cards. I am so glad you enjoyed joining in the swap! Thank you for taking part and for sharing your card with us all. Happy Christmas!!! That is a fun card to receive. Glad you have time off to relax and enjoy this Christmas season. Love the pajama functions. Our newest little Grand niece had a pajama party for her first birthday this past Saturday. Blessings on your gatherings! 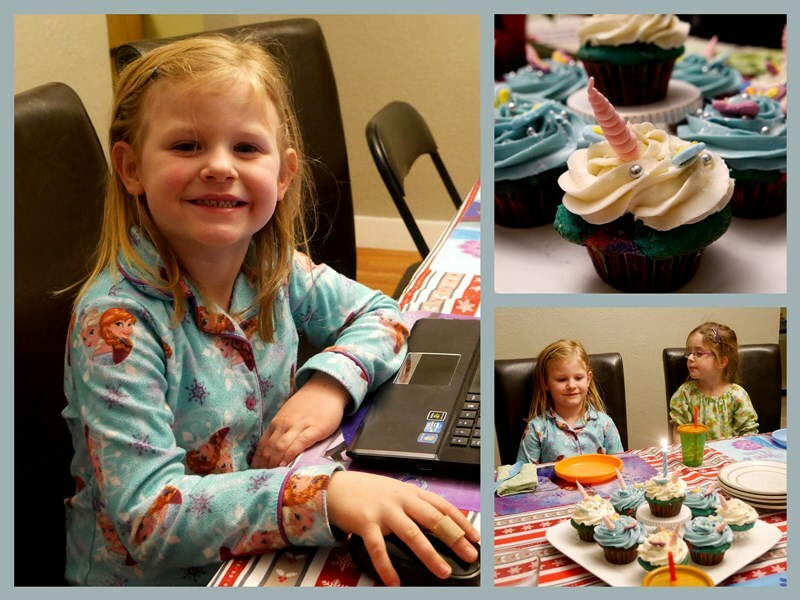 Your little ones are so sweet -- did you make their pjs? our 8yo really wants an old-fashioned nightgown (despite her mother's warning that it will frustrate her terrible by tangling her up at night) and I've hauled out my old machine. . .
Oh, by all means, write while you can! You know how I adore prolific bloggers! That is a fun, playful card. I imagine the grandchildren enjoy seeing the Christmas cards. I remember looking at Christmas cards as a little girl and how much I loved them. Not much has changed there. Lovely picture of your Grandchildren and your husband. The card you received is very cute. A lovely card and your hall display is beautiful. Your grandchildren are adorable and I hope you all have a wonderful Christmas. I too have received far fewer cards this year, but the cards I have received from bloggers has increased! You have received a beautiful collection of cards Lorrie, and your advent calendar is a pretty one. Looks like the grandkids love coming to your house for all the special attention and delicious treats! Merry Christmas! What an adorable post - loved your Deer card from Cathy - I'm like you, enjoying a little more time to blog and post at the moment! Keep it up! I love all the family gatherings this time of year! Your breakfast sounds really good! I like your hall display of Advent calendar and cards. I'm sure the paper whites smell wonderful and welcoming as folk enter your home. I have grown indoor hyacinths for Christmas as I usually do, but they are not ready yet. Lovely photos of your grandchildren and husband. I hope you continue to have an enjoyable pre-Christmas week! Such precious angels...you will blink & they'll be off to college like a few of mine. You will be so very glad you snapped these photos. Memories in the making! My Mom always had paper whites in pebbles near the window so she could have something green & growing through the long winter. I should do that, too. Thank you for the link to the French Toast Cubes. I look forward to trying it next time my grandkidlets visit. Sending you Blessed Christmas wishes & hopes for a Healthy New Year! I love keeping touch with friends, even if it is a Christmas Card. Distance stops meetings but a card brings back so many memories. Have a wonderful Christmas with your family. I'm old school and still like to mail out Christmas cards. I agree that nothing beats receiving happy mail!